If you are a PPC who has arrived on this page via a link sent by a colleague or voter, it is because they wish you to have the facts on animal research before making any decisions on the BUAV’s 6 PPC pledges. The BUAV (British Union for the Abolition of Vivisection) has been contacting Prospective Parliamentary Candidates (PPCs) in the UK’s upcoming 2015 General Election, urging them to back their six pledges against animal research. They are also urging their supporters to send similar emails and tweets to their local PPCs. The information provided in their email contains many examples of misinformation regarding animal research. We urge our readers (especially any PPCs) to share it with their colleagues and PPCs to ensure future UK parliamentarians make their decisions based on solid scientific evidence and not the misinformation of an antivivisection activist group. UK residents should make sure their candidates are kept informed – you can use the BUAV’s candidate finder search bar to find contact details for your local PPCs (remember to delete the BUAV’s preset email or tweet). You can find a suggested letter to your local candidates encouraging them to read this post at the bottom of the page (or click here). Click on any of the claims in the BUAV email below to be taken to the section of this post debunking it. I am writing to announce the launch of our Vote Cruelty Free website, a new platform publicising the views of candidates, to encourage compassionate people across the UK to use their vote for animals in laboratories in the 2015 General Election. Did you know that over 4 million animals are used for experiments in the UK each year? The 2010 Coalition Agreement included a pledge to work to reduce the number of animals used in ‘scientific procedures’, but since then the number of animals licenced to suffer in experiments has increased by more than 11%. Yet according to a 2014 Government survey, only 37% of people agree that it is acceptable to use animals for research. And 95% of new drugs tested on animals fail in human trials. Please can you let us know which of the above steps you support? Please send your response to [us] by 5th January. Candidates’ views are being publicised on the Vote Cruelty Free website, which we will be promoting from January, so that compassionate people in your constituency can use their votes for animals in May. It is true that over 4 million animals were used in 2013 (4.12 million procedures on 4.02 million animals), but let us add some context. The numbers have been generally rising from around 2.5 million in 2000, however, it is far below the historical high of 5.5 million in in the mid-1970s. Furthermore, to put the numbers into context of other animal use, we eat around 900 million chickens per year, and an estimated 220 million animals are killed by pet cats per year. 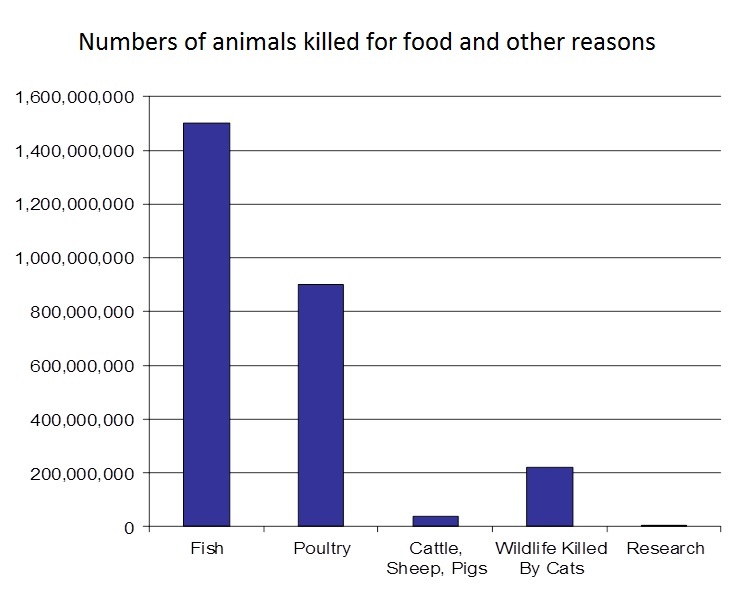 Read more about the numbers of animals used in the UK. We have written about the BUAV’s misguided criticism of the “Broken Promises” on reduction before. Ultimately the problem comes from the word “reduce”. While many people understand “reduce” to mean using less animals overall, reduction (one of the 3Rs) is about using fewer animals in any given experiment to achieve the same standard of results. The reality is that animal research numbers are based on many factors including current research techniques (so while the growth of GM mice research increased animal numbers, the CRISPR GM technique could help reduce it. ), funding for animal research, research environments in other countries etc. To take quotes from the survey (remember that legally animal research can only be done where there is no viable alternative). The survey found 37% believed “It is acceptable to use animals for all types of research where there is no alternative“. The reality is that most of us can think of some type of research we would disagree with (perhaps cosmetic testing, which has been banned across the EU) even if there were no alternative, so it is no surprise that only 37% agreed (and 41% disagreed) to all types of animal research. However the polls clearly show a majority of people do agree with animal research for medical or scientific purposes. All the drugs which pass animal tests and fail at some point in human trials, have all passed pre-clinical tests using non-animal methods (e.g. in vitro, computer screening etc). In that context, if we were to use the same form of words, it would be much more than 95% of new drugs tested using non-animal methods which failing in human trials. Firstly, it should be noted that cats and dogs, together account for just 0.12% of all animal experiments in the UK (mice, rats, fish and birds together account for 97% of all procedures). Both species (and monkeys and horses) have special protections to ensure that they are only used where no other species would be viable. The BUAV has been focusing on this issue for a while despite the fact that nearly everyone – including industry and government – want to reform the Section 24 “secrecy” clause. The Government is well on its way to finalising these reforms. Read this article from Chris Magee, Understanding Animal Research Head of Media and Policy, explaining Section 24 reforms. Most primates used in research in the UK are imported from abroad. All these animals are F1 or beyond, meaning both they were bred in captivity – there are no wild primates in UK labs (most UK primates are F2 or beyond meaning both they, and their parents, were captive-bred). Primate breeding centres tend to be in hotter countries with large outdoor corrals which allow large amounts of monkeys to play together – this is good for animal welfare. UK climate is not conducive to this. Primates account for less than 0.08% of all animal experiments in the UK, they have special protections to ensure they are only used where no other species would be viable. Nonetheless, primates are essential to work in understanding neurodegenerative diseases such as Parkinson’s and Alzheimer’s. Deep Brain Stimulation – a treatment to stop tremors of Parkinson’s patients – was developed through the use of monkeys in research. The statistics which the Government publishes each year tries to distinguish different areas of research including “Fundamental biological research” (28%), “Applied Studies – human medicine or dentistry” (13%), “Applied studies – veterinary medicine” (4%) and “Breeding of GM or HM animals” (51%). This BUAV pledge wants to limit research to the “Applied Studies – Human Medicine or Dentistry” (insinuating this is the only research important for human health). The reality is that without the fundamental research (often called “basic research”), and the breeding of GM animals, the Applied research could not happen. This is not to mention that the BUAV seems happy to ban veterinary research – which is important for animal welfare. GM animals offer a way of “humanising” animals, increasingly their physiological similarity to humans. We can give an immunocompromised mouse a human cancer and then work out the best combination of treatments to destroy the cancer, we can splice in GFP gene (fluorescence gene from jellyfish) to allow us to measure cell death, and GM animals have many other uses. Watch this little video from Understanding Animal Research for more information on the importance of GM animals. When researchers apply for a licence to conduct animal experiments they have to estimate the level of suffering of the animal (from next year they will have to record actual suffering and submit this information back to the Home Office). This can be Mild, Moderate, Severe or Unclassified (where the animal is never woken from anaesthesia). In 2012, 2% of licences were “Severe”, though this does not necessarily mean 2% of experiments are severe. See more on licences here. The Government states on its website that: “We have legislated so experimentation is only permitted when there is no alternative research technique and the expected benefits outweigh any possible adverse effects.” Essentially, if any severe licence will be approved, it is on the basis that this higher level of suffering is justified by the potential benefits to human and animal health. Overall what we see is more misinformation from the BUAV. We urge parliamentary candidates from all parties to reject the BUAV’s approaches, and stand up for the important role of animals in research. If you wish to discuss these points further, please contact us by email or phone. 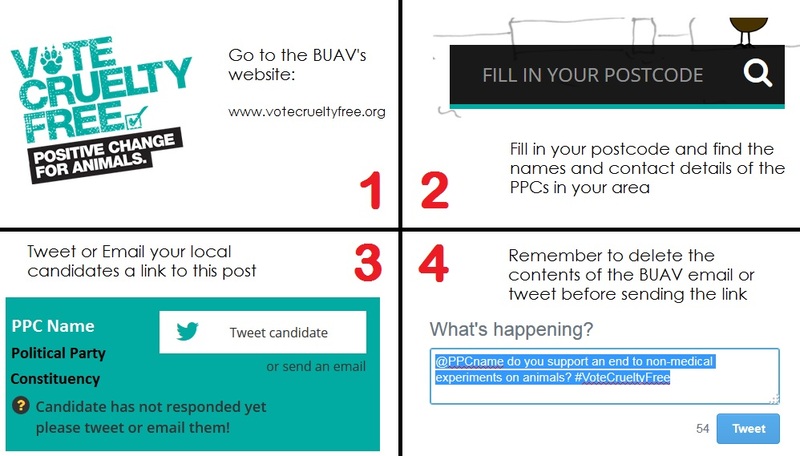 I am aware that many PPCs have received emails from the Vote Cruelty Free campaign (run by the BUAV) asking candidates to support their six pledges on animal research. I am concerned that some of the information sent in these emails may not be entirely accurate. Posted on December 23, 2014 April 18, 2017 by EditorPosted in #ARnonsense, Animal Rights News, Campus Activism, News, Outreach NewsTagged #ARnonsense, British Union for the Abolition of Vivisection, BUAV pledges, Cruelty Free. Next Next post: 2015 – The Year of the Science Communicator!